No fluke, that’s not white sand in the photo. In the wake of the recent snow activity in Ontario, and to help me cool down a little here in Brazil, I bring you this post to encourage you to get out there and enjoy the winter wonderland . You’re young, you’re bold, and you’re ultimately inexperienced. 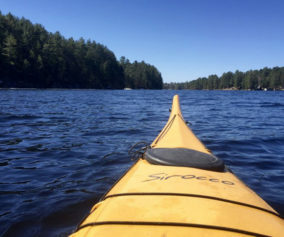 Save yourself the frostbite and long cold miserable nights by turning that frigid, easily forgettable trip into a joyful experience in Mother Nature. 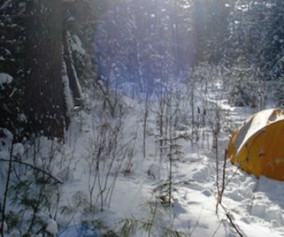 Most campers stay home when it snows, but not you. You’re a trailblazer and an adventurer. Despite the cold and snow, put on your parka and explore the following tips. They will make all the difference. 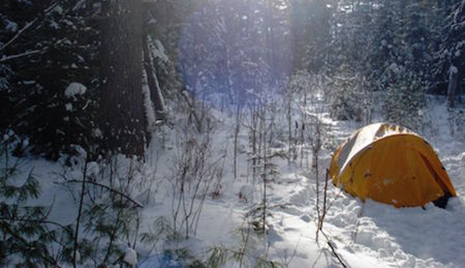 Winter camping is vastly different than any other sort of camping. Whether it is hiking in early December, snowshoeing in February, or cross-country skiing in March, spend the money. I have done trips with very expensive high-quality gear and I have done them with cheaper three-season gear and the difference is unbelievable. I cannot stress enough the difference a four-season tent makes. It is designed to stay upright in heavy snow (which many lightweight three-season tents will not do), has added ventilation to prevent frost buildup inside and many come with large vestibules, front and back entrances and are made of heavy duty material. They may be expensive but if taken care of, will last years. If money is an issue, consider buying second-hand. Kijji or Gear Swap searches offered by MEC are both great places to start the search. 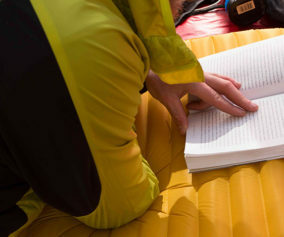 It may seem simple but when you’re cold, exhausted and rushed to set up camp as the sun makes its final descent, the last thing on your mind is making sure you’re organized. 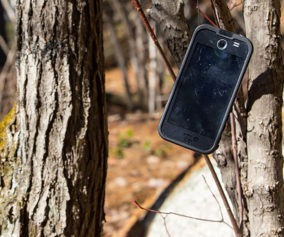 Imagine the following scenarios: you finally get in your tent and warm up your sleeping bag, only to realize that you left your reading lamp outside in the pack against a tree; or decide to leave some of your gear laying around the campsite at bedtime only to wake up in the morning to find a foot of snow on the ground! Nothing can create more panic than, after digging out all your gear, to realize that you left the saw in the bush and have no idea where it is. It’s like trying to find a needle in a snow-covered hay stack. 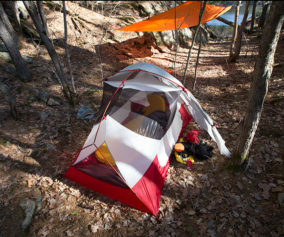 Often what works best is confining all your gear to the vestibules of the tent or if you’re pulling a sleigh, filling it full of gear and placing a solid tarp over it. That way, in the morning, all the gear is snow-free and easy to find, allowing you to have that hot cup of coffee you have been dreaming about. experiences you have never had before and an adventure you will never forget. But make sure it’s unforgettable for the right reasons. Low temperatures, aggressive storm systems and huge temperature changes can combine to turn a lovely snowy adventure into a nightmare. My first winter trip was poorly planned and I was not prepared for what happened in one 24-hour period. Temperatures went from plus 4 and rain to minus 22 the following night. Everything flash froze, from the gear to the boots wet from rain. The result? Laying sleepless inside a freezing tent daydreaming of a warm beach and deciding to cut the trip back by three days. Memorable? Yes. Pleasant? Not exactly. Look in advance at weather patterns, scope out areas you want to travel to and if entering a park, contact the park authorities to see if it is open in the winter. And most of all, never go anywhere alone without informing someone of your well-thought-out plans and dates of entry and return. It sounds overly simplistic and pointless, but when camping in the winter, WHERE you make camp can mean the difference between a warm morning drinking coffee in the sun or a frosty, wind-whipped time huddled inside your tent. 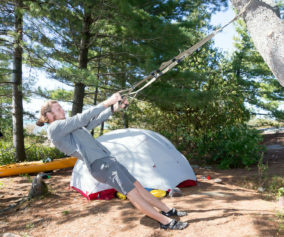 The sun and the wind will be the two biggest factors when planning out your camp. Ideally, you want to pick a camp that not only provides protection from those stiff winds that always seem to find their way down your back, but also offer the warmth of the morning and afternoon sun. In early camping trips, I did not plan out my camp and often spent mornings with the wind blowing snow down my back as I stared out at the warm-looking sunshine, while sitting in darkness. This simple tip can make a huge difference. Nothing beats waking up from a chilly night and standing in the warm-even-in-winter sunshine, out of the wind and letting Mother Nature warm you from the outside and right into your soul. 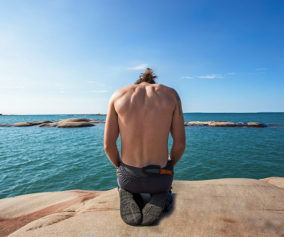 As well, allowing yourself and your gear to bask in the heat of the sun, will help to dry out some of that pesky moisture that always seems to develop. Sure it feels great to get a small sweat going on at noon when the day is at its warmest. It feels great to finally be warm after a long cold night. So you intentionally keep your large down coat on and push yourself as you plough through the snow. It may feel good, but this practice is very unwise. It should be stressed to make sure you dress in layers and more importantly to use those layers. If you start to get too warm and feel sweating is on its way, you can either stop until you cool off or strip a layer and keep moving. Moisture conducts heat away 25 times faster than air and with the potentially large temperature ranges that can occur, you do not want to be sweating when it is -5 only to be in for a -20 evening with no camp set up yet. It should also be noted that all layers are not built equally. Make sure you have proper materials for each layer and avoid cotton. The old saying goes ‘cotton kills’. This is because cotton provides little to no warmth when wet and takes a long time to dry as opposed to newer materials which can still provide warmth when wet and can dry quickly. Layer up and if needed, layer down. Always stay dry. It is better to start moving when you’re cold and heat up than to start warm and get hot and sweaty. There you are — some tips to help you have fun in your four-season wonderland. Go grab some snowshoes, some gear and get out there.